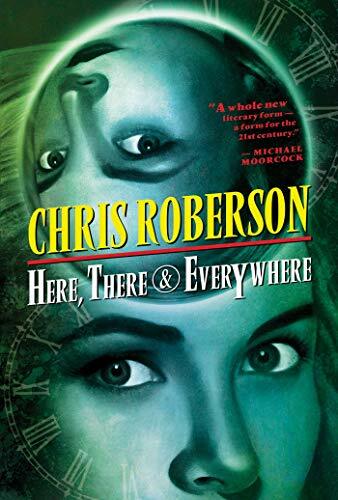 Here, There and Everywhere by Chris Roberson was the rare book with such an amazing concept that, despite other reasons it really shouldn’t have worked, it completely did and I loved it anyway. I found this one looking for parallel universe books, and it is that—with a vengeance. I think it wins for sheer number of parallel universes involved, with time travel thrown in besides. When Roxanne Bonaventure is eleven years old, a dying woman gives her a silver bracelet she names the Sofia. When she’s sixteen and having a very bad prom experience, she wishes to be somewhere far away…and finds herself confronting a Tyrannosaurus Rex in a prehistoric jungle. Thus begins a lifetime of using the Sofia to travel through time and space and parallel universes. There’s a lot of quantum theory involved, and a whole lot of adventures. The novel is structured almost as a series of short stories, as Roxanne travels to various eras or alternate pasts or futures. Roxanne (and the Sofia) are the connecting thread, but the plot connections are very loose. Mostly, that’s okay. On some level the book lacks an overarching drive or purpose, but at the same time…each adventure is SO interesting that it didn’t matter that much to my enjoyment! Roxanne travels to Victorian London to hang out with a Sherlock Holmes-inspired detective, and to the Egyptian desert for an Indiana Jones-inspired clash with Nazis. The story is, necessarily, heavily focused on Roxanne. I didn’t love her as an individual—she was perfectly fine, just nothing grabbed me much about her. She seems largely driven by curiosity in her travels, with minimal connections to anyone or anything, which may have made her harder to connect to. However—she was still pretty awesome to travel along with. The key point was less who she was and more what she was doing, but what she was doing was so interesting that it carried me right along. One of the fun things is some of the practical aspects. Roxanne gets overloaded on her schedule at one point in her life, and starts using time travel to visit a deserted island in 1,000 BC to set up a semi-permanent camp and catch a solid eight-hours sleep before returning to her own life a minute after she left. She buys a house in London in the 1800s when it’s cheap, and then keeps it all through the next couple of centuries, popping in as a base whenever she needs it in any era. She also establishes a life living there in Victorian times; whenever she visits, she simply travels to the day after she last left, so as far as her maid knows, she’s always there! Re: that sheer number of parallel universes (and the quantum physics), most multiverse theories go on the idea that choices of individuals create new universes. In this book, every time any subatomic particle can move left or right, a new universe is created where each choice happened. So…we’re really talking an infinite number of universes. Roxanne does some exploring of the wilder and weirder reaches of the multiverse. This creates some issues too, though. Roxanne can’t change anything in her traveling, because anything she might do simply creates a new universe. In a sense, you can’t improve anything—you can only create another set of alternate universes where things are better, but never wipe out the universes where things are worse. If you see what I mean. It gives Roxanne total freedom to do absolutely anything because nothing matters…but that creates a lack of purpose, since nothing matters. She also realizes early on that the Sofia will never bring her into a universe where she’ll be killed or even seriously injured, so although she gets pretty badass, to some extent it doesn’t matter because she always knows she’ll be fine. That should destroy all the tension…but it’s actually all still pretty fascinating. As I started out saying, for a variety of reasons this book shouldn’t work…but it was just so fascinating, that it really did. A slightly weird, occasionally baffling, but nevertheless awesome read. And the occasional geek reference in the midst of the sci fi didn’t hurt either!